Dog Food Allergies affect about 1 in 10 dogs. They are the 3rd most common allergy for our canine companions - after flea bite allergies and atophy (inhaled allergies). 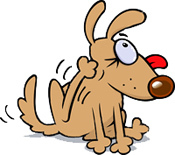 If your dog is not well, how do you know if the problem lies with his food or elsewhere? Schnauzers are no more or less likely to suffer from dog food allergies than other breeds. There's no strong link between specific breeds and food allergies. They equally affect both males and females as well as neutered and intact animals. They can show up when your dog is 5 months or 12 years old - although the vast majority of allergies related to dog food start when the dog is between 2 and 6 years old. Many dogs with food allergies also have other types of allergies. There's a difference between dog food allergies and dog food intolerance. Typical reactions to allergies are skin problems and/or itching. Typical reactions to intolerance are diarrhea and/or vomiting. Dog food intolerance can be compared to people who get diarrhea or an upset stomach from eating spicy food. The good news is that both can be cured by a change in diet to the correct food for your particular dog. As they say in the canine world: "One dog's meat is another dog's poison". Unfortunately, these most common offenders are also the most common ingredients in dog foods! By the way, don't think that if you put your dog on a rice and lamb dog food diet that will automatically cure the problem. It MIGHT, but then again there's a fair chance it won't. The reason lamb and rice were thought to be less allergenic (less likely to cause allergies) is simply because they have not traditionally been included in dog food recipes - therefore less dogs had reactions to them. As you can see from the symptoms listed above, the diagnosis for food allergies is fairly straightforward. The problem is that these conditions may also be symptoms of other problems such as atopy (breathed-in allergies), flea bite allergies, intestinal problems, mange and yeast or bacterial infections. If you can rule out all of the above, then we recommend you start a food trial with your dog. You need to find a hypoallergenic dog food - either commercial or home-made - that will not trigger your dog's food allergies. Another option is to have a blood test on your dog, but many veterinarians now believe that this is not accurate enough. You'll find out more about food trials and different types of dog food on our Hypoallergenic Dog Foods section. 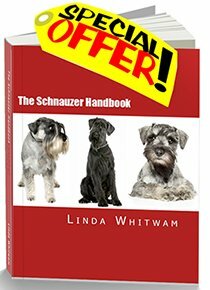 You might also be interested in our Natural Dog Foods section in the Schnauzermania Store. Many dogs with sensitivities or allergies do well with food which contains only natural ingredients rather than processed foods.